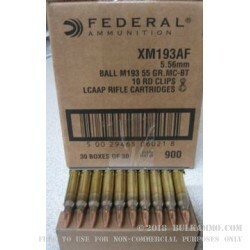 The famous XM193 ammunition on preloaded stripper clips with stripper clip guides in a bulk case lot of 900 rounds. This is an AR shooter’s dream ammunition purchase. The loading time for all those 30-round magazines goes down exponentially with these pre-populated stripper clips to help put some rounds downrange without as much hassle as all the normal thumb loading. 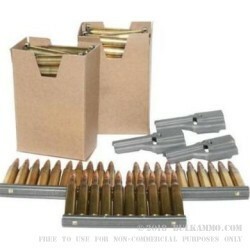 The case is packaged as 30 boxes of 30 rounds each which has the boxes packed as 3x 10 round pre-loaded stripper clips (in each box). These are gorgeous factory new rounds for the Federal Lake City plant and is built on the same machines as the M193 ammunition, which is a staple offering to the military. 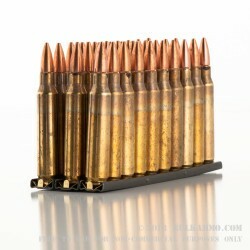 For all intents and purposes this is MIL-SPEC ammunition, although, by contract, Federal is not allowed to sell military contract ammunition to the general public. You are essentially shooting the same stuff as the military guys are. This is a 55 grain full metal jacketed boat tail design projectile in a brass casing with an annealed neck and lacquers applied to weak points on the brass. The primer is a Boxer primer and these are in fact, reloadable rounds The brass itself is impressively good for multiple instances of reloading. A: If you add the product to your shopping cart, you will be able to enter your ZIP code in the "Shipping Calculator" box for a shipping estimate. Q: I have a Smith & Wesson Model M&P-15, will this ammo be a good tactical round to use in it? A: Yes, this Federal XM193 ammo will work well in your M&P15. It is a full pressure 5.56 round that offers reliable and consistent performance. This is the same ammo that was developed for use by the US Military. It was intended to provide increased lethality and a higher chance of hitting the target at ranges out to 500 yards. Whether you are concerned about paper silhouettes, zombies, or Soviet paratroopers, this is a great ammo choice. Q: Do these rounds have a steel core? A: No, the projectiles used for XM193 have a lead core and a copper jacket. Q: Do these rounds feature the same quality lake city brass found in the xm193 distributed to the military? 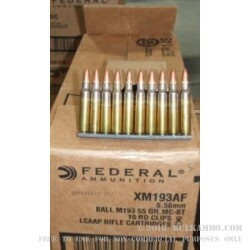 A: Yes, this XM193 ammo is loaded with high quality Lake City 5.56mm brass. Q: I just purchased a new Rock River AR-15 chambered for 5.56x45mm. What is the difference between this product on stripper clips and the other one that you carry in the black boxes, I think XM193J? A: This 5.56x45mm product (XM193AF) is identical to the other stripper clip product (XM193J) that Federal makes with the following exceptions. This product includes the stripper clip guides while the XM193J configuration that comes in the glossier black boxes does not include the guides necessary to load magazines. The only other difference is that this product's packaging is less cosmetically attractive but given that it includes the guides, it's a worthwhile trade off. Enjoy your new AR, this product will work well for it.